Snapplify is a content and media technology company focusing on content distribution and mobile publishing. They provide publishers and content producers with a platform for distribution, reading and retail of eBooks, magazines and newspapers. They are the largest eBook aggregators in Africa with more than 250 leading publishers’ content, more than 100 000 aggregated titles, and over 600 resellers and online stores. They work with Macmillan, Penguin Random House, Oxford University, Pearson and others to aggregate their eBooks within established distribution channels that includes leading retailers and academic institutions. Snapplify, launched by Wesley Lynch, is based in South Africa, with offices in London and New York and partners in Australia, Europe, North America, and Africa. Snapplify formed from respected, pedigree technology company, Realmdigital, which has been servicing African markets for 15 years. Snapplify is backed by AngelHub Ventures, a Venture Capital company backed by former First National Bank CEO Michael Jordaan and the Harris family (RMB Co-Founder, Paul Harris’ family fund). Michael Jordaan sits on the board as director. Snapplify provides clients with a mobile (app) or web-based store from which to sell their digital newspapers, and magazines, called a Newsstand. Clients can add content themselves via the online CMS platform that Snapplify runs on. Content is immediately available for purchase and downloading by users. Users can view free content, or purchase single titles or subscriptions and immediately view them on the provided eReader, available on both mobile and web. Users login with a username and password to access content on a subscription, this enables multiple users on a shared device to access their subsequent purchased content. Publishers can sell their eBooks from their own Web Store online, and their readership need to download the Snapplify Reader to their Android or Apple device to read the books. Publishers can also sell vouchers, which when redeemed will give their customers access to the eBooks attached to the voucher. The Snapplify Reader app supports any content that is sold in the mobile store. The web reader allows users to read their content on their PCs and Mac computers via a browser. Some clients offer the same service for mobile and the web so that users can access their content on both devices by using their login details.The Reader has a full range of academic tools designed to transform textbooks; students can make notes on shared mobile devices as well as bookmarks, share pages, and highlight. This eReader software is supported across multiple platforms and integrates with student sign in, which allows data to be stored safely in the Snapplify Cloud servers. The Reader has been made PXE compliant. This service enables publishers to sell their eBooks in bulk to an established distribution channel of institutions, schools, and retailers signed on by Snapplify. 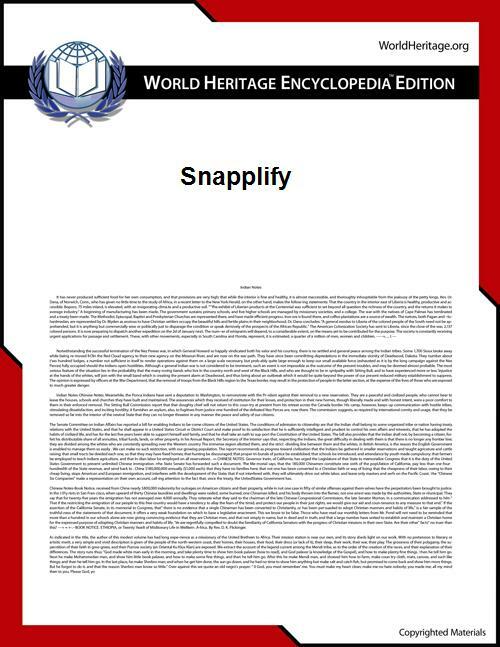 Publishers give Snapplify the license to retrieve their content directly from their servers, apply SnappSafe DRM to it, and sell it for them. Publishers benefit from this established aggregation service that has little to no setup fees or administration hassles. Multiple publishers are already signed up to aggregate their eBooks via Snapplify, these include Oxford University Press SA, Pearson Education SA, Macmillan SA, Van Schaik Publishers, Via Afrika, Cambridge University Press, and many more large and small publishing houses. The digital publishing mobile solution supports other DRM services, but Snapplify have developed their own DRM tool called SnappSafe DRM. This software prevents unauthorised access and distribution as the content is encrypted. The major differences between this particular DRM and other popular tools is that it does not require licenses for a mobile reader or a content server, as well as being developed to specially support embedded and streamed video and audio, and right to left ordered content for Arabic or Hebrew users (due to their foreign language template support). The SnappSafe DRM passed the strict international security audit set out by [Pearson Publishing] and is also [PXE] compliant. Booksellers and other retailers can sell Snapplify's aggregated eBooks from their own Snapplify eCommerce store or integrate the eBooks with their existing one. Booksellers and retailers use their aggregated content as it expands their catalogue and also enables certain retailers branch into eBook retail. SnappBox Schools using Engage get a SnappBox which helps them save on bandwidth costs as well as significantly reduce download time. The SnappBox enables easy, bulk eBook distribution within schools and has helped rural schools embrace eBooks and improved user experience overall. The SnappBox can be sold separately for retailers, institutions, and companies. It has won multiple awards for its innovation including the FutureBook Innovation award. Before Snapplify were two years into business they had won a start-up Entrepreneurial competition known as Launch Cape Town,  a global start-up competition. In November 2014, Snapplify won a prestigious publishing award at the FutureBook Innovation Awards for the Best Technology Innovation for their eBook Distribution Hardware: the SnappBox. AngelHub Ventures, a Venture Capital company backed by former First National Bank CEO Michael Jordaan and the Harris family (RMB Co-Founder, Paul Harris’ family fund), announced its investment in Snapplify in February 2015. Snapplify is one of the largest aggregators of Arabic content, and have passed the international security audit set out by Pearson Publishing. They were finalists in the Global Entrepreneurship competition in Barcelona. They are ranked in the Top 25 PWC Vision to Reality Awards, and were finalists in the Book Expo America start up challenge.